The pool-construction process started on time and was completed earlier than expected. The contractors were there according to schedule, and the communication of the construction scheduled was great…I have several friends who had purchased pools from Blue Haven, and every one of them has had a good experience. 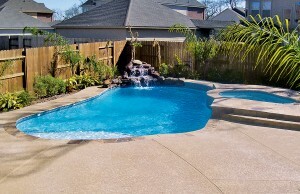 Whether you have budget concerns or construction obstacles for putting in a new pool, our experienced Houston staff can usually find a solution. If the dimensions of your outside property are limited, we can create a small pool design such as a cocktail pool or a custom configuration that optimizes the available space around your house—even using part of a side yard. If your yard has a slope, we can build a retaining wall and even incorporate it into the overall pool structure to maximize use of space and create an attractive, multidimensional custom poolscape. Are mosquitoes a concern because your yard is adjacent to a swamp? We can enclose your pool and spa in an outdoor screen room to keep out those flying pests. And like many Texans, you may want to finance your new swimming pool. If so, Blue Haven is a great pick for helping arrange a lender suited to your budget and credit profile. Your pool designer will explain options for securing a loan, for all or a portion of the swimming pool cost, or you can complete a free online pre-approval form here on our website. 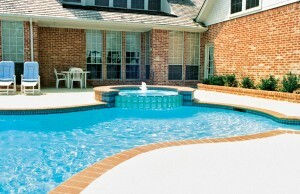 We also accept Visa and MasterCard for certain portions of payments on your new pool. 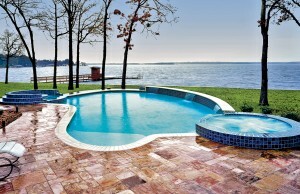 From Baytown to Wharton, from Madisonville to Galveston, thousands of Greater Houston-area homeowners enjoy a Blue Haven pool. In fact local homeowners have been turning to Blue Haven for more than 50 years! Along with the numerous homeowners, professional home builders count on Blue Haven as well: We are the pool contractor of choice by CityView Homes, Colony Builders, and Noel Luxury Living. The Houston operation has also won the independent Top Choice Award in year after year since 2016 in the pool-builder category. We have also been honored with multiple Pulse of the City Awards. A track record like this matters when you’re investing thousands of dollars with a pool builder. After all, you should know what you’re getting from day one. That’s why our design specialists will show you a 3-D virtual reality rendering of your dream pool and backyard, and that’s why we will provide you with a detailed contract and written warranties. 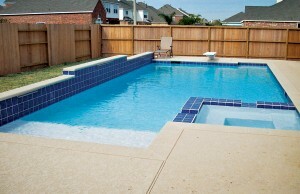 So when you’re ready to beat the Texas heat, call our Houston pool professionals for a free in-home estimate. You can also stop by our design center with two working display pools. Open six days a week and Sundays by appointment. Se habla Español.